MINER - FROM THE BILL HARRIS WESTERN FIGURE COLLECTION - The Miner or Prospector is portrayed as a crusty old character complete with a beard; one arm is extended with a few gold nuggets in the palm and the other appears to hold his gold pan. His blue jeans give the appearance of a year's accumulation of dust and grime. He almost seems like he will spring to life and begin relating his advetures on the road to his "strike." 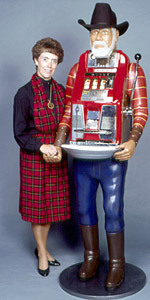 With the Mills Classic Hightop remanufactured by MILLS BELL-O-MATIC, the figure stands just over 6 feet tall. Price and availability will be quoted.